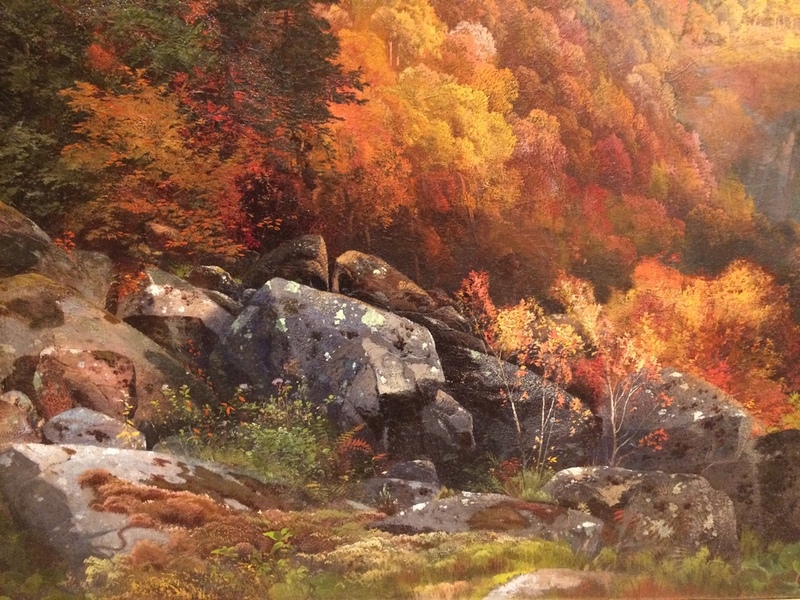 Thomas Moran, Valley of the Catawissa in Autumn, 1862. In the previous posts I discussed my first impressions of the museum and talked about my experience at the Picturing the Americas symposium, but in this one I'm changing it up a bit and talking about one painting in particular, Thomas Moran's Valley of the Catawissa in Autumn. During my four days at the museum I circled back to this piece about 20 times and it was without a doubt one of the works I was drawn to most at Crystal Bridges. This post got away from me a little bit. I originally set out to talk about the Hudson River painters, but instead found myself contemplating the true power of an image. At first glance Moran's painting seems like just another moutain beautiful view of the Appalachians. A predictably foggy morning that resembles every other painting and photo you find of these mountains, but there was an undeniable magnetism with this work. It's a similar view to what I've seen hundreds, if not thousands of times. In a flash all of those memories and personal history interlaced with a painting loaded with so much context and meaning. It was the most real and sublime experience, I've ever had with a work of art. There is something to be said for the simple power of place in a work. Even though this painting is a little over 150 years old, there are so many resemblances to home for me that feel familiar, but also leave me awestruck in a way I hadn't been for a long while. Over the years as an art student you realize that not many people feel the paintings of the Hudson River Valley are relevant today. Part of that is true, as can be said of any artist that made work in the past, because history never lives in the present. Part of that is also false, becuase history still plays a credible role in the way we live our lives everyday and propel ourselves forward. For me I've always admired their work, theres not doubt its technically solid and showcases the beauty of the land, but it also has a strong political connotations, personal history and was a founding movement for American art. Several strong traits that should never be discounted. So why is it that so many people can't seem to get past this nagging feeling that these images are done? That they are trite, over wrought and something that any contemporary artist should shy away from in their own work? This is not to say that in the canon of art history they have been downplayed in any way, but as an influence and lineage for contemporary artists its sometimes hard to link back to that particular movement. It's like there is a gap or they are on a pedestal that is out of reach and can't be touched. Obviously this is a lie. If you paint any landscape in North America you reference these painters in some way and link onto a tradition that has defined this country like no other. This is what I was thinking about while sitting on that bench in the museum, coming about as close to some type of meditation as I ever will. It was then I came to the realization that it's not the Hudson River School's paintings that we have a problem with, it's the percieved idealism that feels tired and outdated. The idea of perfection in a place has become so loaded, there are moments we can't get past them. This idealism is what most people associate with the Hudson River School, so its easy to see why they have acheived both canonical status and notoriety in the art world. I mean they are partly to blame for the rise of Thomas Kinkade, someone that unabashedly took what these painters were trying to accomplish and turned it into something without any semblance to reality. Creating a distorted, absurd and sickly sweet idealistic fantasy. The Hudson River School was more than ideal in their work though and I think that's what a lot of people miss. These painters were depicting the way a nation was growing, spearheaded an entire shift in political symbolism to nature, bolstered the attachment of religion to the natural world, the changes in the landscape due to natural resource consumption, had a strong voice in land politics and were a cause for conservation movement. They took all of those ideas and added to them the strength in depicting places that were also steeped in personal history. You can feel the care and the reverence in the way the works are painted and there is no denying it. The power of place is real in these images, they are testaments to a specific time and intentions. This is what most people grab onto without realizing it and is what makes us feel the work versus just seeing the work. Beauty in the form of idealism is long gone in contemporary art circles, we are all but numb to it and in some ways that is a good thing. Making work today is much different than it was 150 years ago, audience included. People can get an implied sense of sublime from any image on an iPad, iPhone or what have you. It's been oversensitized and so when we really get hit in the face with an artwork or moment in real life its hard to actually enjoy it, or hell even recognize it. It's something you've seen too times, but havent really paid attention to. As a landscape artist today it's my job to make people stop and take notice. I have chosen to still make beautiful, sublime images reflcting back on what the Hudson River painters set out to do, but my images are almost the reverse in intention. My goal is not nation building, I work with a strong sense of place and personal history at the forefront. It's to show the strength, humor and turmoil of living a rural life in places today. To look at how technology, changes in resource and land politics have deeply personal impacts. It's to bring attention to these forgotten or unnoticed moments of sublime in everyday life. It's linking back to the American landscape tradition, while redefining it at the same time...making it mine and mucking it up a bit. So when I look at the Thomas Moran piece above I see more than the beauty of the landscape, I see a charged image full of intention, one which I graciously nod back in the work I have chosen to make.